ACTIVITIES: Close By Activities include: Lots of golf courses to choose from, Wave Runner Rentals, Water Parks, Gulf Coast Zoo, Putt Putt Golf, Dinner Cruises, Shopping at the Outlet Malls and The Wharf, Various Festivals (seasonal) & Night Life. Tour historic Fort Morgan just a few miles away or take the ferry over to Dauphin Island for a visit to the Dauphin Island Estuary. Several restaurants, a marina and boat dock are nearby. Nearby along Fort Morgan Road is the scenic Bon Secour National Wildlife Refuge.. a haven for nature lovers. COTTAGE: The full-size kitchen has a stove, refrigerator, dishwasher, microwave, and garbage disposal. Dishes and linens are provided, (also toaster, blender, crock pot, deep fryer, large lobster pot, & blow dryer) and full size washer and dryer. All on one level, there is easy access to the cottage with convenient parking. The beach is across the street, 0.4 miles from The Rookery. Walk to the beach or take your car and park right at the beach for easy access. 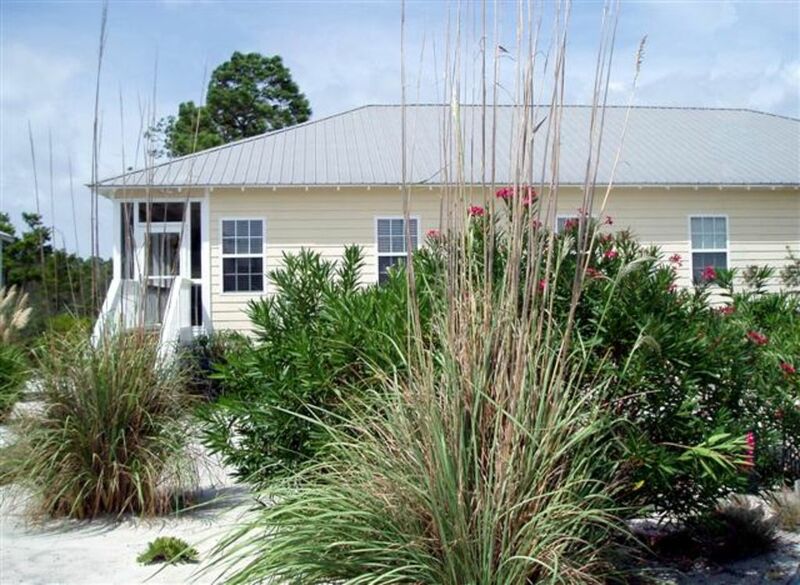 THE ROOKERY COMMUNITY: The Rookery was designed to be a natural and quiet resort and is located adjacent to the Bon Secour National Wildlife Refuge. This is a wonderful place for kids to play and swim as the large pool has an extended shallow end where little ones can wade and walk right into the shallow end with no steps to climb. This pool has a hot tub, as well as a covered gazebo area and a large poolside bathroom. There is a community grilling area with picnic tables and a tennis court. The public beach is a short walk down Cortez Street. The cottage is fully furnished and decorated in comfortable style. Approx. a 1-minute walk to the pool and about .04 mi to the Beach with great beach access and beautiful ocean and sandy Beach. Plenty of parking and easy access to the cottage allows for convenient unloading and loading upon arrival and departure. All the conveniences of home with ocean and beautiful sandy Beach nearby...... plus large community pool, hot tub, tennis courts and plenty of local activities for the whole family to enjoy. Towels, washcloths, 1 bar of soap and 1 roll of tissue provided in each bathroom. Beach is directly across the road and approx. .04 mi. There are 3 public Beach accesses nearby. The ocean and beautiful sandy Beach is across the road and approx. .04 mi from The Rookery. Towels, hand towels and bathcloths are provided. Fully equipped with dishes, glassware, flatware. Almost every utensil you could possibly need. Also, equipped with a small charcoal grill for outdoor grilling. Just bring charcoal & lighter. Full kitchen equipped with full-sized refrigerator/freezer/icemaker, stovetop, oven, & double sinks w/disposal (including dishes, pots, pans, toaster, blender, crock pot, deep fryer & lobster pot). Dining area seats 6 at table. (Only 4 chairs in photo) 2 additional chairs are in nearby bedroom. Two stools allow for additional seating at kitchen island. TV trays also provided. An assortment of videos plus a few books, puzzles and boardgames. Sandscape.... sandy area where children can play. Screened porch seats 4 with 2 stools for additional seating. Small patio at the cottage entry with water spiket. A great place to grill or just wash off the sand after a day at the beach. Community tennis courts near pool and picnic/grilling area. Beautiful community pool with extended shallow end where little ones can wade & walk right in with no steps to climb. Also a hot tub, covered gazebo & large poolside bathroom. This is a no smoking unit. However, the porch will accomodate smoking. This is a family area and it remains quiet at night. No glass in the pool area please. Children should be supervised at all times. We had a great time at the Rookery. From the pool and hot tub to the close proximity to the beach and restaurants, I would for sure go back. Carol was very easy to work with and had great communication. The place was just what we needed for our family. I highly recommend it!! Highly recommend! Just bring some bug spray ( biting nats/mosquitos in the afternoon). Wonderful spot though, close to beach, and store. Everything we needed! Lovely escape from a Michigan Winter. This cottage at the Rookery is decorated beautifully with 3 bedrooms and two bathrooms. We had everything we needed and enjoyed being located on the road to Fort Morgan. The ocean is just a short walk from the cottage and takes your breath away. Would definitely recommend for anyone wanting to explore the Gulf Shores area. It was beautiful. We had a great time. Easy walk to the beach. Would definitely go back. Had an amazing time and Carol was great to work with!!! Perfect spot for families! The Rookery was designed to be a quiet resort located adjacent to the Bon Secour National Wildlife Refuge. Get away from the traffic and crowds and still enjoy the conveniences of a large marina, boat dock, several local restaurants and convenience stores all nearby (from 1/2 mi. to 5 miles) and so much more. Play games outside with the kids, birdwatch, bike the designed trails, or explore one of the Bon Secour marked trails with your family located nearby. Historic Fort Morgan is only 6 miles away, or take the Ferry to Dauphin Island and visit Fort Gains or the Sea Estuary. There are 2 championship golf courses within a couple of miles. A short 15 mile drive into Gulf Shores and you can visit Waterville, the Gulf Coast Zoo. the Track and much more offering amusement park rides and arcade games, etc. Numerous restaurants also await you. Drive up to Foley and visit the Tanger Outlet, a large outlet mall. The security/damage deposit will be promptly refunded after your stay, provided there are no damages.